I highly recommend looking into alternative options, as there's certainly no shortage of cognitive enhancing substances around. Piracetam and the related Aniracetam have been fairly beneficial for me, particularly for the mid afternoon lull that you mention. Most importantly (for me at least) they're not as harsh as highly caffeinated drinks typically seem to be. Strangely, I can drink espresso virtually all day but one can of "Rock Star" makes me feel like I'm having a particularly grueling out-of-body experience. Make of that what you will. 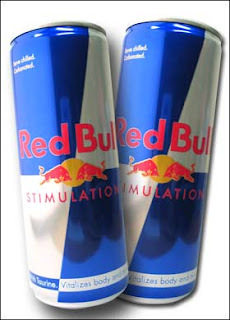 Warning: from personal experience taurine = instant migraine, and I do mean instant. I find it weird that people in todays society that have sedentary lifestyles find they are constantly tired and they assume that a simple energy drink will be the answer. When in fact, they are putting a band-aid on the real problem. But based on your CrossFit blog, I can see why you would be tired in the afternoon. I get tired at around 4pm after I workout at noon as well. But I am loyal to my afternoon Tim Hortons coffee. No energy drink in the world can match one of those! The most important statement of this post doesn't include any link to backing evidence. I'd be interested in the clinical evidence that you're talking about. Such an obvious "infomercial" _ give me an effing break. @Dustin: Much of this article was researched in Wikipedia. The entry on energy drinks will provide the references you're looking for. Researched in wikipedia? Come on, George, you can do better than that. Do you drink coffee daily? I don't and I think that's why energy drinks "work" so well for me. The effect fades slowly if I drink them every day. Caffeine tolerance? energy drinks is not the solution for you not to be sleepy. you are just abusing yourself take best multivitamins for both men and women everyday. so you will have a healthy way of living.